Magic Johnson may be the enduring face of Michigan State basketball. Mateen Cleaves came to represent its heart while leading the Spartans to the 2000 national championship. Gregory Kelser, however, personifies the soul of the program. Kelser collaborated with Johnson to lead MSU to its first NCAA title in 1979. Here he discusses his role in the Spartans’ victory over Indiana State and Larry Bird and how that game triggered college basketball’s surge of popularity that continues to this day. He also provides insight and opinion on the successes, failures, players, personalities, and coaches who came before and after him at Michigan State, including Jud Heathcote, Tom Izzo, Scott Skiles, and Steve Smith. 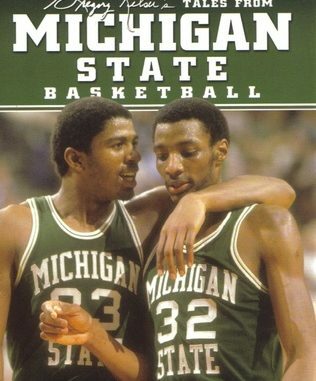 Gregory Kelser is a former Michigan State University forward and co-captain who earned Academic All-America and first-team All America honors while helping the Spartans win the 1979 national championship. He was a first-round draft pick of the Detroit Pistons and played in the NBA for six seasons. He is in his 21st year as a basketball broadcaster, currently serving as an analyst on Fox Sports Net’s Pistons and ESPN Regional’s Big Ten coverage. Gregory resides in Franklin, MI. Steve Grinczel is an award-winning journalist who has covered Michigan State University athletics for Booth Newspapers since 1986. He has also contributed to various publications, including Sports Illustrated and the NCAA Division I Basketball Tournament game programs. Past titles include Michigan State Football: They Are Spartans (Arcadia, 2004). Steve resides in Haslett, MI.